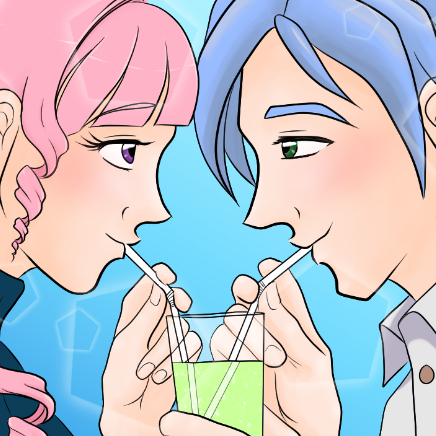 Continuing the discussions from New Webtoons Pledge Eligibility, let this thread specifically be for Networking and finding others to Cross-Promote with, on both Tapas and LINE Webtoon. Unlike sub-4-subs, cross-promotion means two creators are promoting each other's comics. 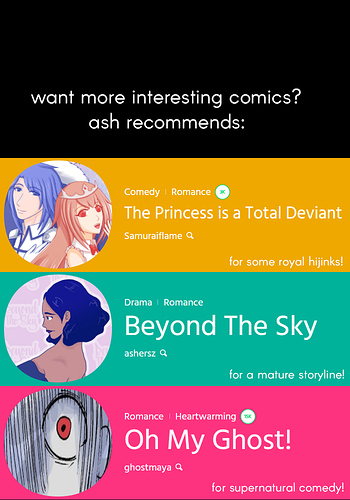 It is simply a recommendation section for your readers, meaning it is up to them to check out the other comic or not. 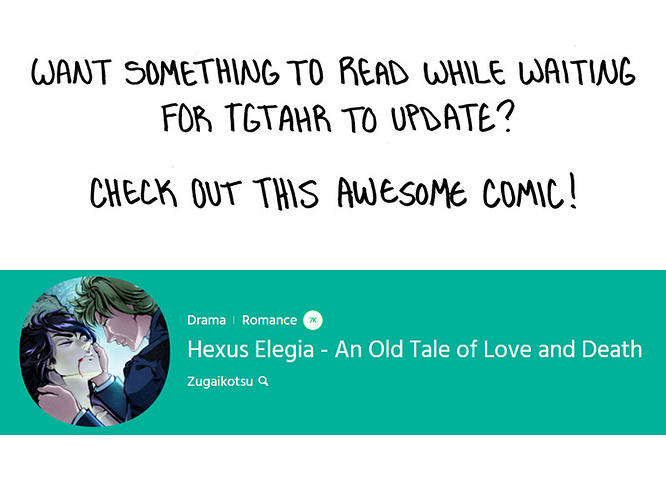 On Tapas, you can also include people's banners and/or link the other comic(s) in your description. Remember, this is a thread for networking! 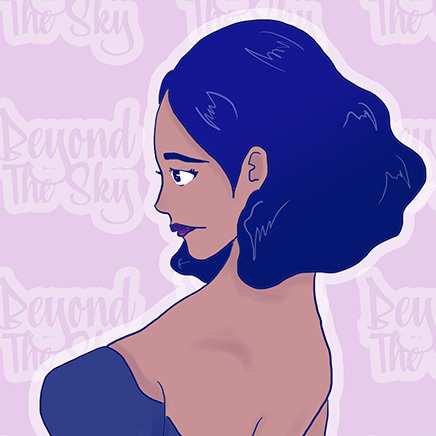 Be sure to tag and reply to others in the thread if they have spots for cross-promoting, and make sure to offer it as well on your own comic. This isn't a place to dump a link to your comic and walk away. 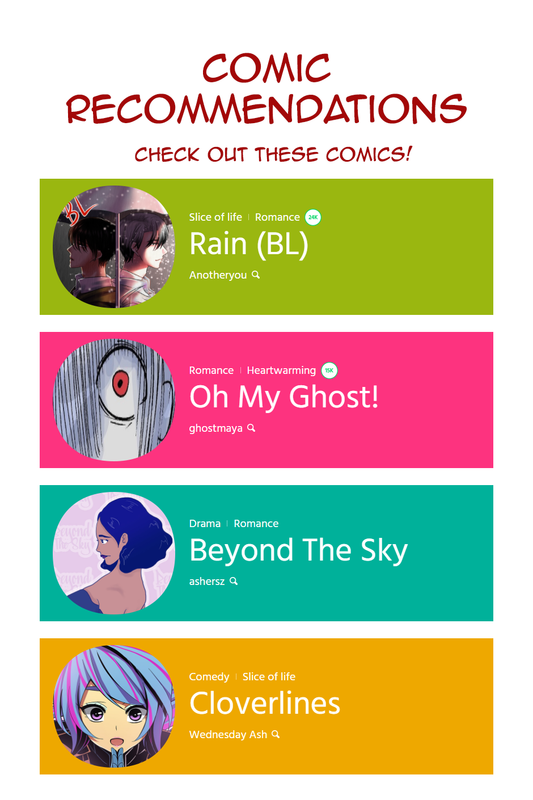 Talk to other creators, find comics with genres similar to yours, etc. 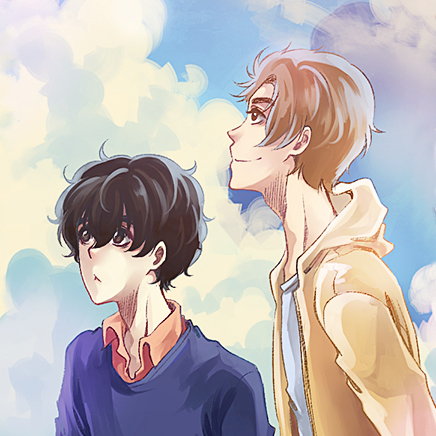 To start it off, I'll be offering 2 more spots for cross-promotion this week on Webtoons! Just reply if you're interested! Cool, I'll add your banner to my next update! My comic updates on Saturday night, so I'll let you know when it's up. so am i in? i have a clean banner if you want? Oh yeah, I was mainly taking comics on Webtoons, so this works. Added you to my list! Im actually dropping in a couple of hours so how does this reccomend thing worjk again any examples? Here's how I'm doing it. I'll have this page at the end of my next update. And here's my banner for easy grabs! will do it in like 2 hours ! Are there still any spots left for me? Follow the romantic interests of four high schoolers. Alright, @Zugaikotsu, your comic has been shared! Not the most aesthetically pleasing promo, but it works? Lol. Is there still a spot for me left? If anyone's interested, please reply to this post or send me a message! The next update will be on January 14th, and I can offer 5 slots. @beta1042 and @zerofruits I'm full this week but I can include your comics in my update next Saturday, if you don't mind waiting. Again, everyone is encouraged to promote with each other so make sure you guys open your own spots! @Samuraiflame sure, do you mind if I do your's this week? I plan on only doing this sort of thing once a month so that readers don't ignore them and I'm doing 2 others already this week. @zerofruits I'm interested and have romance. Let me know if you're interested. @beta1042 Yup, please do! I also think it's more effective to promote a few at a time to avoid overwhelming people. If I could, I'd love to promote everyone at once, but spacing them out allows for more spotlight. I gave my own kinda..."review" to it at the bottom right corner so its stylistically coherent w the rest of my comic. 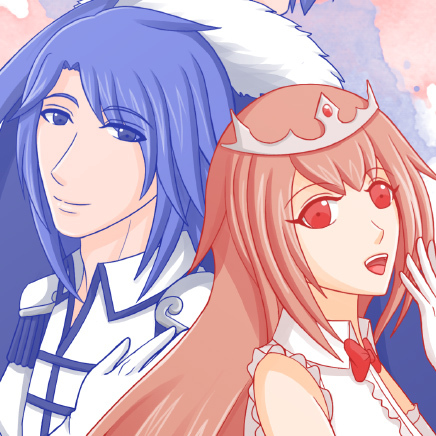 finally a forum of cross promotion~! 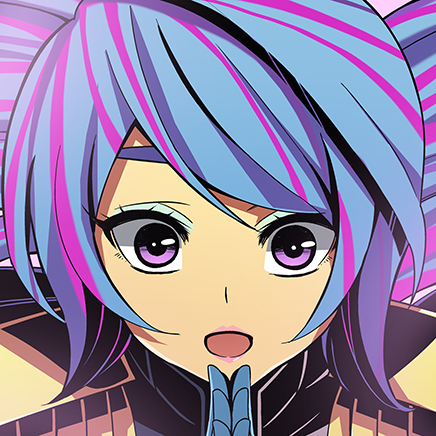 Thank you so much @Samuraiflame for the cross promotion and for making this forum~!